I went into this novel from a different perspective from some of my fellow book bloggers. I can't say if my expectations for The Demon's Lexicon were higher or lower, given my familiarity with Brennan's writing, only that they were different. 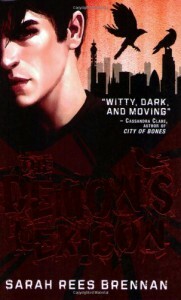 And what I can say about The Demon's Lexicon is that not only were my expectations met, they were exceeded. About part way through I figured out a plot twist and was a little annoyed by it. I felt like it was like watching an M. Night Shyamalan film - of course there was going to be a twist, and this one was so incredibly obvious and dare I say it?) cliché. And then I reached the end of the book, and discovered that the plot twist I had "discovered" was nothing compared to the ending, which knocked me flat on my back like the Flash had just run me down from behind. Well done, Sarah, for that. I totally did not see that coming, but now that I know that little secret I was able to see all the little hints and suggestions - all the little things that had niggled me now made shocking sense. I love a story that has an ending that is subtly hinted out throughout the story, and has not been pulled out of the author's behind at the last minute. So many seem to be doing the latter these days, and it was wonderful to see The Demon's Lexicon not succumbing to that laziness. But at its heart, The Demon's Lexicon is about the characters and about sibling devotion. They are all wonderfully written, and are coloured with many different shades of grey. Their strengths are balanced by their weaknesses and all of them are so alive and real. I can definitely see why girls would fall for the darkly dangerous Nick (who keeps his sword under the kitchen sink) but my preference is definitely for Alan. He can read Sumerian? A man after my own heart indeed.